Intelligence is power. As part of our "We Speak Geek" Webinar series, Secunia partners with some of the most recognized System Center experts to present on topics that are informational and important to you. Join us on Tuesday, Dec 17th at 1:00pm CST for our next We Speak Geek Webinar. 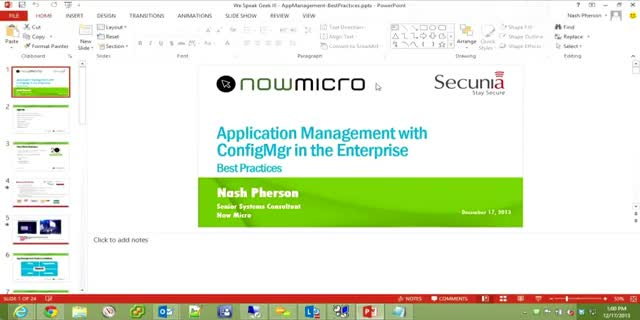 During this 45 minute presentation, systems management expert, Nash Pherson, will walk through application management best practices for Microsoft’s Configuration Manager (ConfigMgr) in the enterprise. He will discuss methods for making silent, supportable, clean, and complete application deployments for the Java Run Environment, and demonstrate how Secunia’s Corporate Software Inspector (CSI) simplifies this process and enables enterprises to keep applications up-to-date with ConfigMgr Software Update Management.